The New Synagogue was built in 1866 and was the main synagogue for Berlin’s Jewish community. Just one glimpse of the building is enough to appreciate how its Arabian style gives it the air of the ´Alhambra` in Granada. 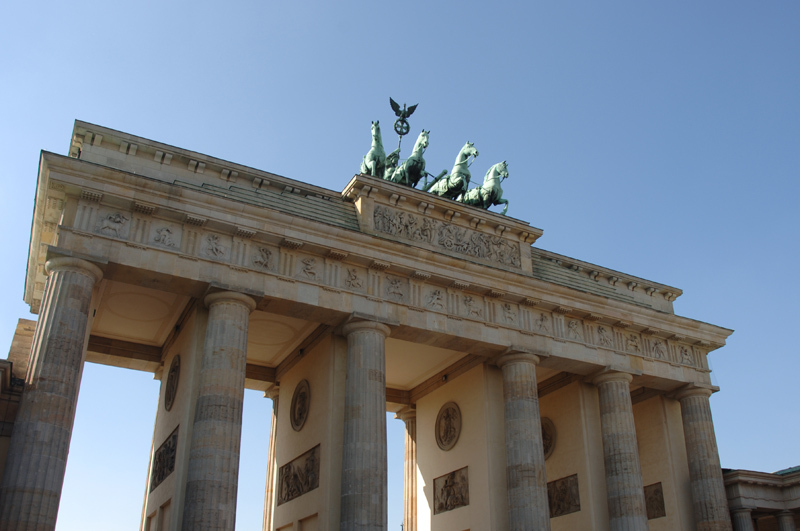 It is one of the city’s most beautiful buildings and it comes as no surprise that it is considered one of Berlin’s most outstanding 19th century architectural monuments. The synagogue was designed by the architect Eduard Knoblauch. The facade is richly decorated with coloured bricks and terracotta. However, what stands out most is its enormous, Byzantine-style gold cupola, which can be seen from many points of the city. Its construction made heavy use of steel, which at the time was an innovation as this material was not often used in architecture. You will see examples of it in the columns of the entrance and the splendid cupola. In fact, the building is a good example of the first architecture projects to incorporate this metal into their design. The New Synagogue has experienced some difficult moments during its history. The first took place on the ´Night of Broken Glass`. Being a Jewish place of worship, the Nazis tried to destroy it by setting it alight. Fortunately the fire was put out and as it was registered and protected as an ´architectural monument`, it escaped further damage. However, bombing during the Second World War did not take into account its architectural value and caused it great damage. When the Berlin Wall came down, a restoration process was started. This carried on the original design of the building’s facade and cupola. As the synagogue came to life again, so too did the whole district. It became a dynamic area full of different kinds of restaurants and clothes shops. Until July 2006, the New Synagogue was the headquarters of Berlin’s Jewish community, however for questions of security this was then moved to the Charlottenburg district. Currently the building is the headquarters of the Berlin New Synagogue Foundation.